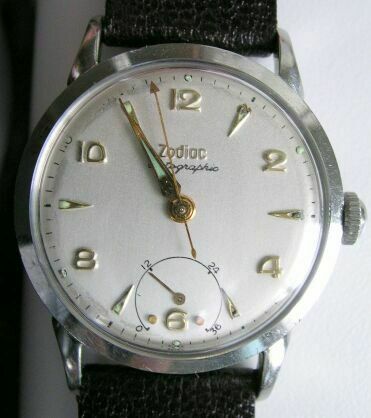 ZODIAC "Autographic" Automatic with a wind indicator (indicates how much the mainspring is wound). 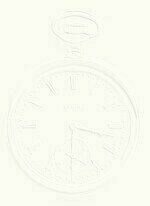 This indicator is at the "6" on the dial and in the photo the indicator shows that the mainspring is about half wound. The white dial has been refinished and the watch is in excellent shape. The markers between the "10" and the "11" are faint. The hands and the hour markers are gold colored. The movement and the dial are signed as is the outside back of the case. The case is solid stainless steel and the back screws on. 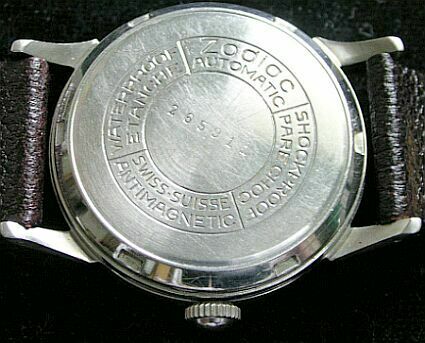 The case number is 265XXX, a 50's watch that has been well cared for. The movement is a bumper model and it self-winds well from the movement of the wrist. The watch was completely disassembled and cleaned in a watch parts cleaning machine and adjusted as it was reassembled and oiled. It has a lifetime white alloy mainspring, the crystal has been replaced, new leather band. Case is 32.5 mm, lugs 18mm. # 1173 $ 225.00 + shipping.